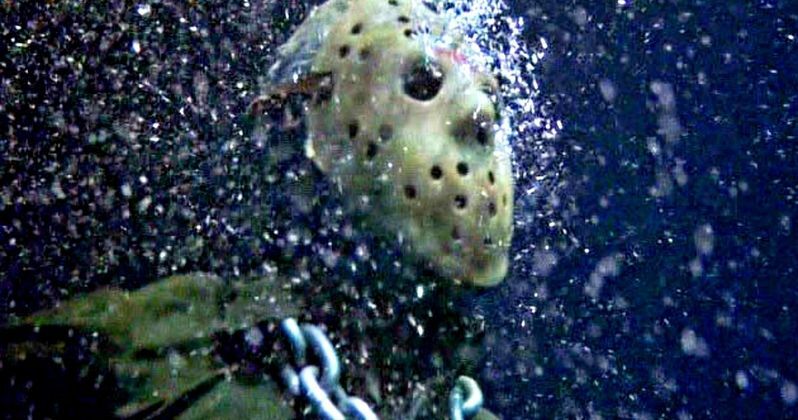 Unsuspecting divers in Minnesota are in for quite the scare if they stumble upon the Jason Voorhees statue that was placed at the bottom of a popular diving lake in Crosby, Minnesota. The statue was hidden there a few years ago by Friday the 13th super fan Curtis Lahr and it has seen some wear and tear from being 120 feet below the surface, but that just adds to the creepiness factor. It's weird, the worn appearance actually makes the statue look more life-like, which is pretty messed up. Curtis Lahr placed the Jason Voorhees statue at the bottom of the lake in 2013 in honor of Friday the 13th, but specifically Friday the 13th Part VI: Jason Lives. At the end of Jason Lives, Tommy Jarvis attaches a chain to a massive rock and drops it in Crystal Lake, the same place where a young Jason drowned as a child. The visual of Jason drowning in Crystal Lake is a powerful one, which makes this machete wielding, mask wearing statue at the bottom of the Minnesota lake so amazing. The video footage of a scuba diver finding the Jason Voorhees monument is pretty creepy on its own. The Lake is dark and murky, leading to the diver utilizing a flashlight to be able to see what's hanging out in there. And then boom, at 120 feet, there he is. Even after years of algae collecting and general wear from being 120 feet underwater for years just makes the statue even scarier. Just imagine a diver stumbling upon it randomly without any prior knowledge. For Friday the 13th fans who would like to experience something similar without scuba certification, Camp No-Be-Bo-Sco, the original camp that was used for Crystal Lake in the first movie and they're offering over-night stays starting this April for the first time. There's all kinds of VIP ticket bundles and exclusive experiences tied into the camping ground, which is an active Boys Scout campground these days. The demand is so high that they're having to run a lottery system for diehard fans}, so maybe it will be easier to get the scuba certification after all. Though the statue of horror icon Jason Voorhees was planted nearly 5 years ago, divers are just now starting to stumble upon it, turning it into a viral sensation. In Chris Lahr's YouTube video showing off the Friday the 13th statue, he had to put a disclaimer in the comments because people were claiming that it's fake. He explains. "Jason is a fictional character, there is no such thing as a real Jason. This is simply a statue of the character. To comment this video is fake implies you believe he is a real person. Like Santa Claus and the Easter Bunny, he doesn't exist.﻿"
Seems weird that Lahr would have to put that disclaimer there, but people can be pretty weird sometimes. The Jason Voorhees statue at the bottom of the Minnesota lake is not fake news and you can check it out below, thanks to Curtis Lahr's YouTube channel.